Don't have an user account yet? Create your hotel with just a few clicks and set up your hotel interface connection. Integrate your hotel system into your gastronovi Office cash register system. You can book restaurant sales to rooms, guests and paymaster accounts. 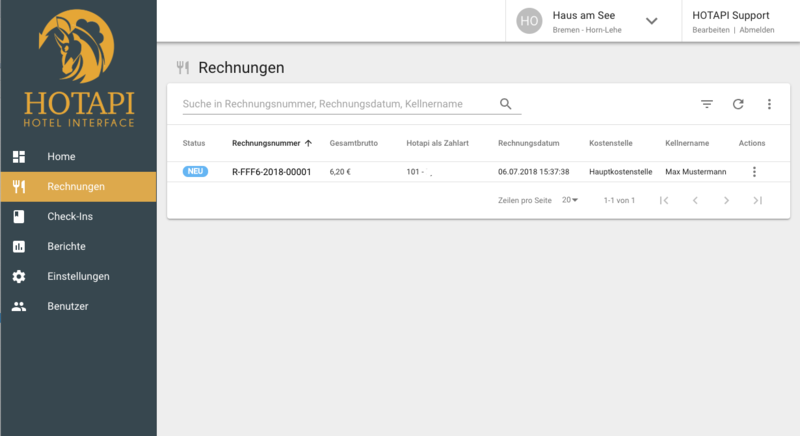 With HOTAPI you can view the transfer status of your restaurant sales. So that you can keep an eye on the data flow between your systems. You are interested or have questions about HOTAPI? Contact our sales and support team. HOTAPI supports selected hotel software systems. The range of functions may vary depending on the system..
With HOTAPI, your restaurant cash register and your hotel software system / PMS are securely connected. HOTAPI enables booking from the cash register system directly to the guest's room and transmission of all invoice items to your PMS. Depending on the PMS used, HOTAPI can support you in configuring and assigning product groups, for example. HOTAPI is available for selected PMS. After you have created your hotel in HOTAPI, you can link HOTAPI with gastronovi Office. To do this, activate the HOTAPI integration in the gastronovi settings and store your data from HOTAPI. In the Integration Center, you have the option of triggering a master data transfer. Since 2008, gastronovi has been unwaveringly pursuing the goal of digitising gastronomy. With a consistent single-source approach, we stand for genuine, helpful IT solutions that promote the catering trade and do not overtax it.